Perseverance is a repeating theme in God’s word to us. 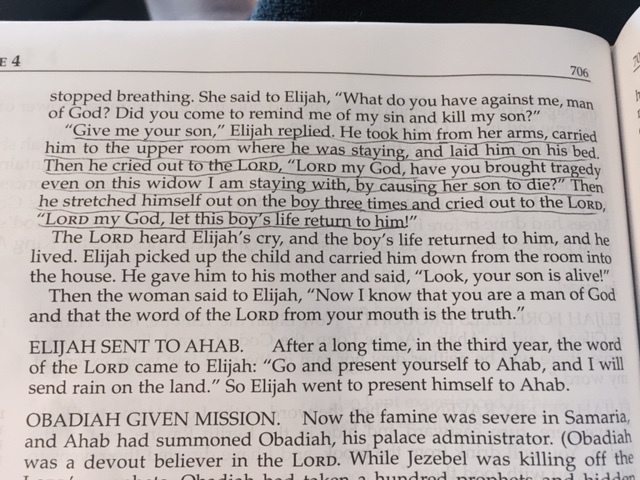 In 1 Kings, we read about Elijah bringing the son of a widow back to life. Elijah stretched out on the boy 3 times, crying out to the Lord to let this boy’s life return to him. Elijah didn’t do this just once and, when nothing happened, shrug his shoulders and say it must not be God’s will. He didn’t do it just twice, hoping maybe the 2d time something would happen. He did this 3 times. And I really wonder how many times Elijah would have kept doing this? Calling out to God! Crying aloud! How many of us stop asking God for something if he doesn’t answer the first time? Or the second time? How many of us persevere in asking again and again? 5 times? 50 times?. Would Elijah have kept doing this until God answered? I believe God always answers our prayers and requests. It’s not always a ‘yes’ like it was for Elijah in this situation. Sometimes its a ‘no’ or a ‘wait’. As Elijah persevered, God answered. I believe God would have shown Elijah his answer even if it was a ‘no’ or a ‘wait’. Something would have happened that told Elijah God’s answer. Elijah wasn’t giving up. He wasn’t stopping. He believed God was going to answer and Elijah was going to keep calling out until he got a clear response from God. God teaches us over and over in his word that he honors perseverance. Please help us grow our perseverance and faith, Abba Father.